Your Support "Drives Us On!" Expresses confidence in our school's Mission and direction. With your dedicated support, we can continue our honored traditions at AWHS while inspiring excellence, developing leadership, strengthening faith in our community and building confidence in a bright future for our students, present and future. I wanted to pause to thank all of you who have given so generously to our School, and to ask those who for whatever reason have not, to consider doing so this year. The philanthropy of our dedicated donors has provided the funds and means to establish and develop our thriving 7th and 8th Grade Program and construct the new, state-of-the-art Nazzaro Science Lab and Dignan Student-Athlete Training Center. We have also been able to create a new mid-campus amphitheater which has quickly become a central meeting site for our students, faculty and staff, as well as a new walk-ways connecting our campus buildings. Moreover, we are thankful and excited to report that we will continue our campus "make-over" plans with the establishment of a new student center (in place of our cafeteria) this summer. But as always, there is much to do and many miles to go before we rest (there is no time for "sleep" here). In the meantime, your participaton and support of the Williams Fund, our annual fund, is of the utmost importance. The Williams Fund's unrestricted proceeds allow us to focus on areas which need the most immediate attention while we continue to cultivate major or lead gifts for transformative capital improveent projects. 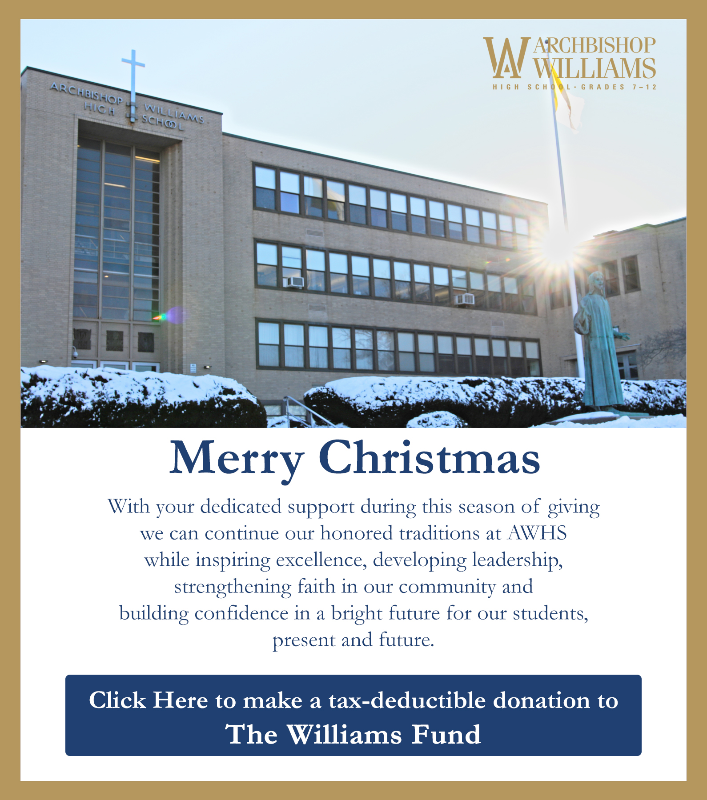 Therefore, I ask, respectfully, that you resolve to give to the Williams Fund this year. If you are already a donor, I thank you and ask that you consider increasing your giving level. I can assure you that every dollar counts and is put to good use.